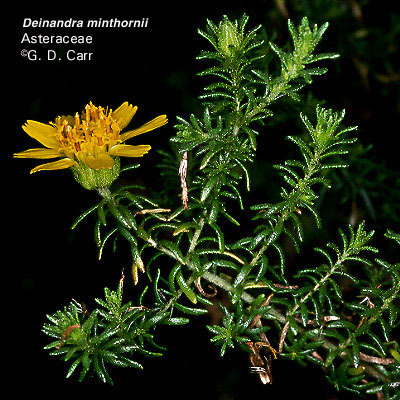 Deinandra is the largest of the mainland genera of Madiinae, with 21 species, including 15 annual and six perennial or facultatively perennial species. The genus occurs primarily from NW California through the Coast Ranges and adjacent valleys to S California, the Channel Islands, and S to Baja California. Plants 0.5-12 dm high. Heads radiate; phyllaries 3-35, each half-enclosing a ray ovary; receptacular chaff scales in one (or two) series at periphery of disk or rarely scattered; ray florets pistillate, the corollas yellow; disk florets 3-70, functionally staminate or infrequently perfect, the corollas yellow; anthers black or very dark in 14 species, yellow in the remaining seven; ray cypselae beaked, epappose; disk cypselae epappose or bearing 4-15 generally linear to lanceolate pappus scales. Chromosome numbers include n = 9, 10 , 11, 12, and 13, with n = 12 being most pervasive (11 species). 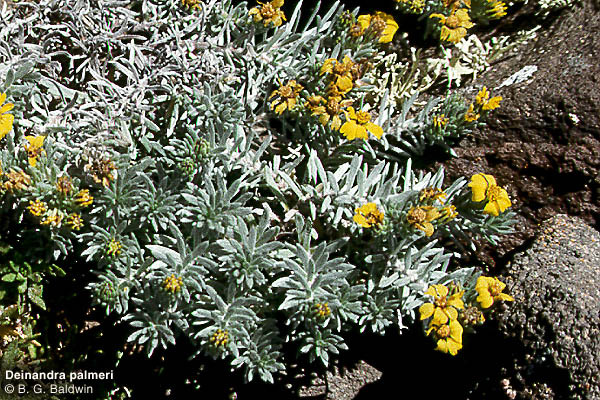 D. greeneana, green foliage in foreground of photo (D. palmeri with flowers and gray foliage appears in the background); mesa at S end of Guadalupe Island. 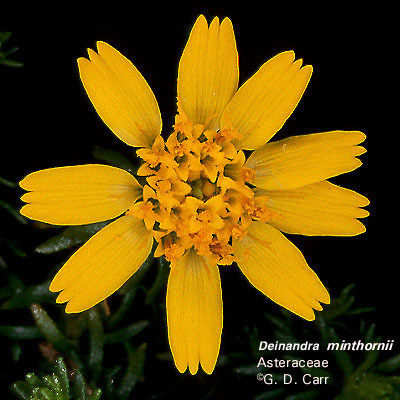 D. minthornii, a perennial, yellow-anthered species (cultivated specimen). 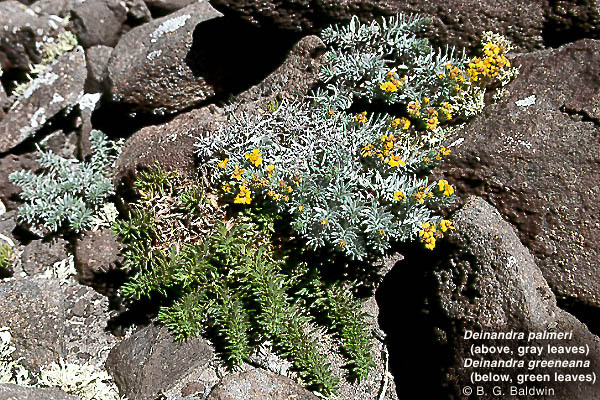 D. palmeri, mesa at S end of Guadalupe Island.